Please join your neighbors in our twice annual neighborhood garage sale. Your HOA will place an ad in the Flower Mound Leader as well as the "family" of papers to ensure maximum coverage. There will also be an ad on Craig's List. The advertised times for the sale is 8 am to 2 pm. 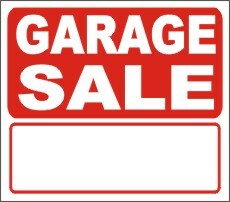 If you missed an earlier HOA garage sale, this is the second of the twice annual neighborhood garage sales. Your HOA will again place an ad in the Flower Mound Leader as well as the "family" of papers to ensure maximum coverage. There will also be an ad on Craig's List. The advertised times for the sale is 8 am to 2 pm.